Guess where my son wanted to go again this weekend? That’s right … Penny Park. For those that have skipped my first two posts on the great park – see them here and here. When we got there, someone was having a party. 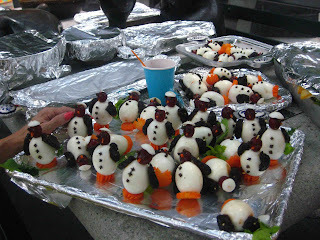 How cute are these egg penguins? The body is a hard-boiled egg on a carrot stick. The head is a grape, the arms are prunes and the buttons are cloves. Martha Stewart step back! 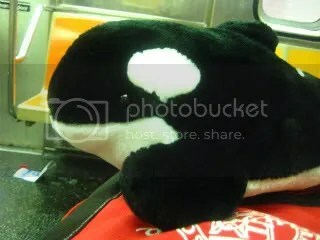 This is Shamin, my son’s “pet” on the subway. He trekked with us through the sweltering heat. His fur must have made him very hot, but Jacob wanted to remember his journey with us.